The perfect gift for the magical unicorn lover in your life. 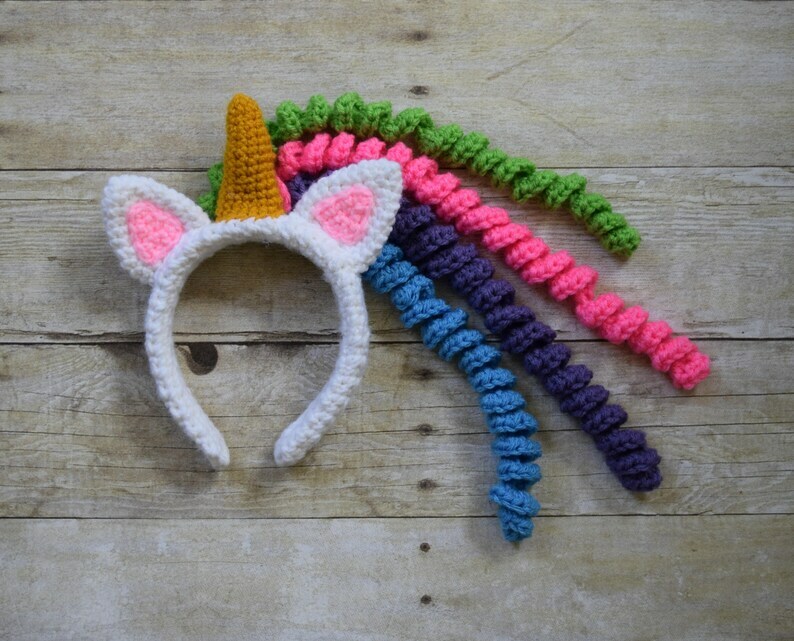 This Unicorn Headband is perfect for ages 3 to Adults and is sure to bring a smile to her face. This headband fits 3years - adult; if needed it can be secured a little more with bobby pins. It is crocheted over a white plastic headband that is 1" wide and 14" long. The horn is crocheted in the color gold, stuffed with polyfill, and 3" high. the 4 Curly mane is approx. 13" long. I am currently working on more colors and will post a photo when done. Message me if you want a different color scheme. Made lovingly in a smoke and pet free home with Durable Acrylic Yarn. These headbands are crocheted by me and are made to order so please allow up to 2 weeks for them to be made and shipped (although this is worst case scenario). Please note that actual colors may vary slightly due to variance in computer screens and dye lots. Remember - this item will be handmade especially for you - your headband may not look exactly like any others!